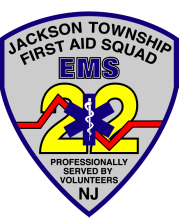 The Jackson Township First Aid Squad is available to assist local community events by providing ambulances and emergency medical technicians. Please fill out the form below to tell us about your requirements. Please note that the Squad's duty hours are between 6pm and 5am every day, so while we can provide a standby ambulance during those hours, it will be contingent on available staffing. The Squad requests at least two weeks notice for any standby to assure proper staffing. A donation to the Squad for this service is customary.